… if you’re on the left coast, that is. He’s starting in Vancouver on Aug. 28 and ending just over the Mexican border with a solo sunrise concert on Oct. 1. One highlight of the tour is his septet performance at Los Angeles’ Angel City Jazz Festival on Sept. 27 and 28. But he’ll also be making a swing through the Bay Area, Sept. 16-19. His itinerary here includes the improvising group Orchesperry, a Braxton-blowing quartet with James Fei, and a duo with Myra Melford. The full itinerary is at the front page of Bynum’s web site. Hopefully he’ll find time to record the experience in a blog entry or two. The atmosphere darkens on Night Loops, the latest album by Jack o’ the Clock. The band still plies its trade in a smart blend of pop, prog, and folk, but the layers of electronics and percussion have thickened. It feels like the already sophisticated band has gotten even more sophisticated. Electronics, sound effects, and dense production have been on previous albums, but they’re unleashed in force here, in circles widening further beyond the rootsy music that always felt like the band’s starting point. “Ten Fingers” hammers that home, emerging slowly with skeleton-bones percussion and mysterious violin; the eerie mood persists even as the catchy melody comes in. Later, the song is enriched by Jason Hoopes’ long, coiling bass riffs from the deep — a thick mix of prog and funk. There’s also the eerie crawl of “Fixture,” full of chimes, effects, and dramatic violin. “How the Light Is Approached” is a different kind of madness, a time-bomb chatter of instruments and voices. Leader Damon Waitkus hasn’t abandoned the pop side of his songwriting, though. The mostly acoustic “Come Back Tomorrow” harkens back to mostly acoustic presentation and catchy songwriting, as does the deceptively simple “As Long As the Earth Lasts,” which is highlighted by nifty guitar and bassoon solos. Rich songwriting has always been a strength of the band, along with high musicianship. Leader Damon Waitkus’ hammered dulcimer remains a stalwart voice, with a pinging sound between a piano and a Fairport Convention mandolin. Emily Packard’s violin deepens the atmosphere but also adds some gorgeous melody, including a soaring section on “Come Back Tomorrow,” and Kate McLoughlin’s quirky, jazzy turns on bassoon and bass clarinet are always a delight. One of the best showcases for all this talent is “Salt Moon,” a squiggly instrumental full of sharp turns navigated by Jordan Glenn’s drums. A lot of these songs have been honed in live performances and then polished in the studio. It comes together in a cohesive, intelligent album that should open a lot of ears. That video above is a demo of the “In C” iPad app, which lets one person command a mini-ensemble through Terry Riley’s seminal piece, the composition that helped turn minimalism into a movement. “In C” turns 50 this year, and to celebrate, sfSound ensemble leader Matt Ingalls teamed up with Professor Henry Warwick of Toronto’s Ryerson University to create this app. I missed the app’s concert debut, which was the other night at The Uptown in Oakland. Warwick came out to the Bay Area, playing the app as his instrument in a larger ensemble that played “In C.” It’s all a little bit meta, isn’t it? If you’re not familiar with “In C” … the composition consists of 53 composed phrases, all in the key of C, none of them very complex. More than one consists of whole notes, indicating a drone effect. What makes the piece is that the players move forward through the 53 phrases at their own speeds. They do stay in tempo, as I understand it, but they don’t have to stay synchronized. You want the overall ensemble to keep up — no one should be stuck on Phrase 2 if the rest of the group is on Phrase 17 — but you also want them to be playing different phrases. The overall effect can be like a gentle showering of bells. It’s one huge major chord that’s splintered into snowflakes that land softly on your shoulders and hair and shoes. Alternatively, I’d imagine it could be a drone, or — in the hands of someone like Acid Mothers Temple, who recorded “In C’ along with companion pieces “In D” and “In E” — a blissful psych explosion that just keeps exploding. And now you can do all that with just a couple of fingers and an iPad. The app appears to be free, so have at it. 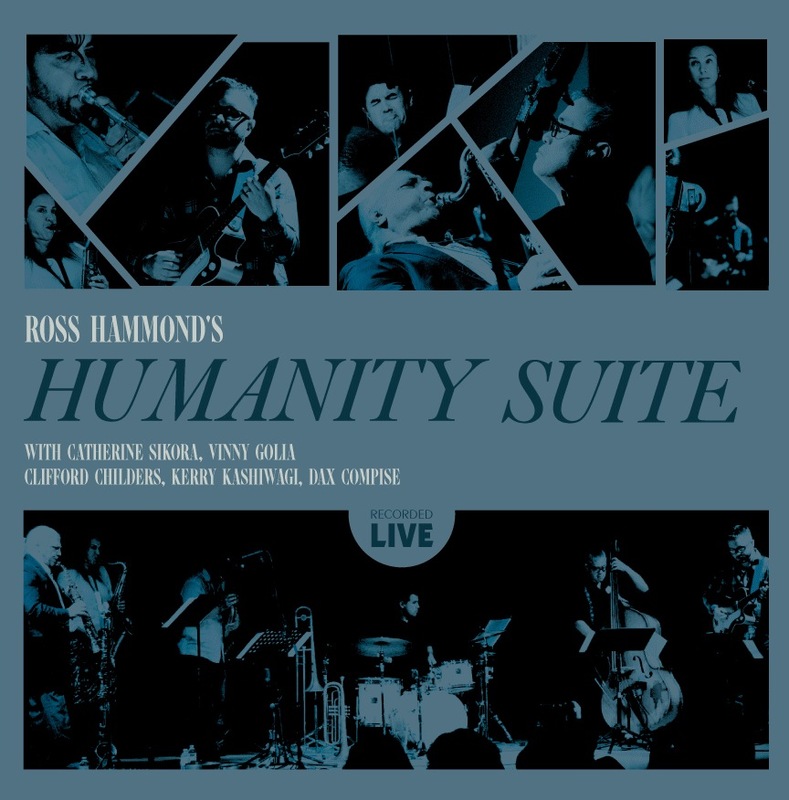 With Humanity Suite, guitarist Ross Hammond has created an extended piece that’s certainly free and aggressive but exudes a sense of serenity. It’s a free-jazz statement based on rhythms that become the foundations for individual solos — an uncluttered, free sound with lots of chances for soloists to soar. We got tastes of this on Hammond’s quartet albums. The heart of the music is the same: Hammond’s fuzzed-out guitar, spinning bright and bluesy forms in a mostly contented spirit. I think of it as sunny, with an African influence, but Hammond can also pour it on. Early on Side 2, he turns up the electricity, egged on by Dax Compise’s splashy snare-and-cymbal playing for a tough-shredding solo. Eventually, he steps aside for another horn free-for-all that ends with a slowly fading triplet rhythm in 15/8. Kara Walker’s “Life at ‘Ol’ Virginny’s Hole’ (sketches from Plantation Life).” It measures 12 feet high by 85 feet long. Source: walkerart.org; click to go there. The occasion for the Suite was a commissioned concert at Sacramento’s Crocker Art Museum in October. It coincicded with an exhibition of works by Kara Walker, an artist who draws from African-American history for her works. She’s best known for silhouetted pieces set in the Civil War era, and she recently made headlines with an installation for the condemned Domino sugar refinery, a set of works crowned by a 40-ton sugar sculpture in the shape of a sphinx. Inspired, Hammond decided to use the same sense of history, injustice, and truth-telling as the backdrop for the instrumental suite. It’s not tied to particular pieces of Walkers; it’s more about the spirit, especially when it comes to her detailed silhouettes that tell complete stories. That’s the sense he wanted to convey. For all its bustling freedom, the suite carries a calm demeanor, a contented wisdom. 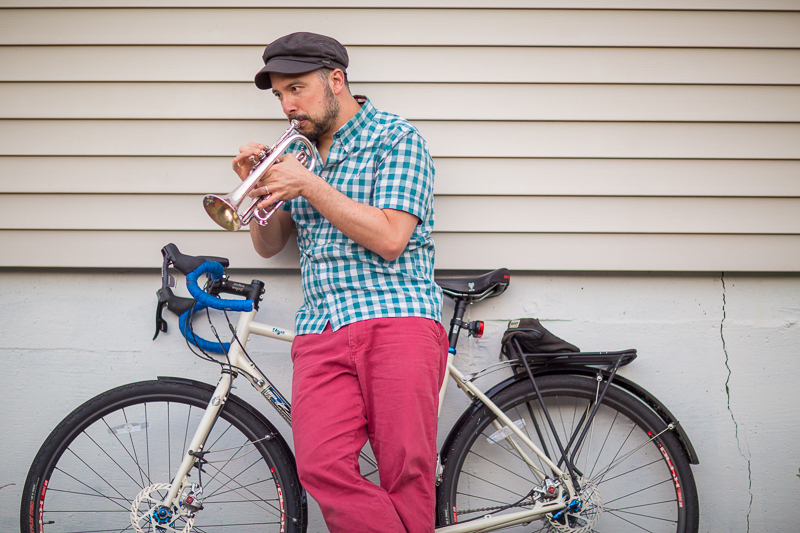 The early mood is patient, set by open-air guitar lines and slow trombone melody, but around that, the horns calmly trace their own paths. Throughout the piece, the horns command most of the attention, not only in the high-energy solos by Catherine Sikora and Vinny Golia on sax, or Clifford Childers on trombone, but for their adept free-improvsed interludes between composed sections. A fairly long, busy improvisation for the horns in the middle of Side 1 is the perfect break to set up a new phase with somber tones against Clifford Hilders’ trombone solo. Even during Hammond’s high-energy solo early in Part 2, which includes some high-voltage free jazz from the entire group, a sense of reverence pervades. Humanity Suite is meant to be weighty, and it pulls that off without becoming stiff or heavy-handed. Humanity Suite is a vinyl release, but you can also buy it digitally at Bandcamp. Human Feel got a predictably enthusiastic response at Kuumbwa Jazz Center, thanks to the turnout of fanboys (and girls) like me. But they also won over the Santa Cruz regulars and Kuumbwa members who’d come not knowing what to expect. I heard at least a couple of them walking away happy, in a chattering and giddy mood. The band’s music, full of sharp-angled melodies and spans of loud improv abandon — certainly doesn’t fit the normal jazz arc, which is what attracted me to the band in the first place. But their tunes often have pleasant and traceable themes, and the band performed with convincing punch and verve. I’m sure they made a few new fans that night, and they didn’t disappoint the old ones. The set was good, of course, and packed with energy and sweat, but Andrew D’Angelo‘s stage banter won the crowd over, too. He’s got good stage presence, but he was also gifted with some material in the form of a three-hour flight delay out of Seattle and a couple of lost bags. Airline troubles are nothing new to veteran musicians, but they still provide good stories to tell on stage. 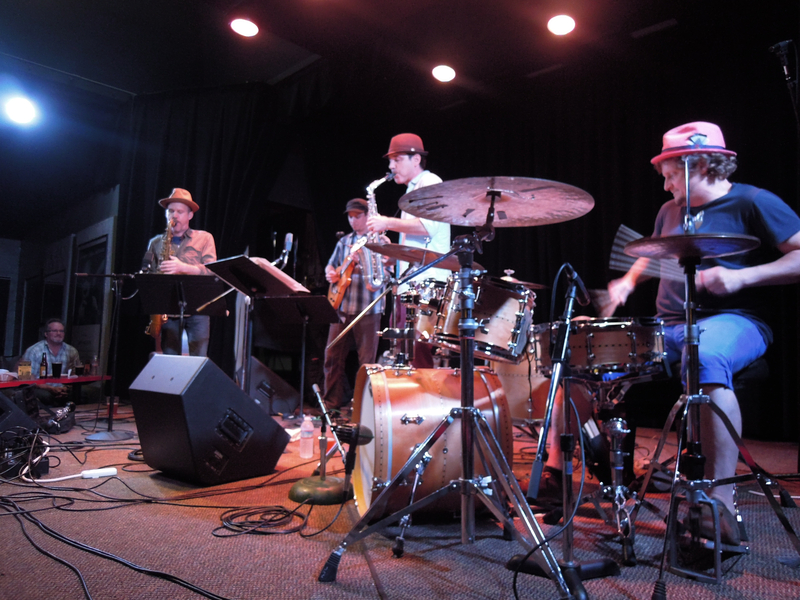 The upshot was that the band, minus Kurt Rosenwinkel‘s guitar pedals and Jim Black‘s drumsticks, got into Santa Cruz just after the designated 7:00 p.m. start time. They rushed through a “live” sound check, testing out borrowed gear while we in the crowd finished our dinners and desserts. As reward for our patience, we got D’Angelo’s spasmodic sax energy, the heavier guitar-hero side of Rosenwinkel (who spends most of the time in the background with this band, but it’s a hard-working, space-filling background) and of course Jim Black’s drumming, which quite a few people came for, judging by the crowd response. I chose to sit on Black’s side of the stage, so he drowned out the others sometimes (which is why I don’t have much to say about how Chris Speed sounded) but that was a conscious tradeoff, and I wasn’t the only one making it. We got to savor Black’s shapeshifting grooves, full of explosions, torrents, and subtle clinks and clanks. They tried something really different on “Numer Ology,” a piece D’Angelo said was inspired by cosmic questions about the meaning of existence and the arbitrary nature of fate. Most people took it as a joke, but D’Angelo was diagnosed with brain cancer seven years ago and defeated it without chemo or radiation therapy, so these questions mean a lot to him. The song consisted of short phrases and short improvisations, all separated by long, weighty pauses. It was at one highbrown and good-humored — and then at one point, D’Angelo picked up the mic and cued us to shout out our meaning-of-the-universe theories after the next phrase. Apparently most crowds just blurt it all out at once; we kind of did it one at a time, classroom-style. It wouldn’t have sounded great on a record, but people got into it. If Human Feel has anything like a hit single, it’s “Sich Reped,” D’Angelo’s poking, sharp-angled 7/8 tune, and that was their closer. Most of the tune went by at a slightly slower pace than on the album Welcome to Malpesta, making for a sound that was still fun but not as jabbing as it could have been — until the end, when D’Angelo and the others opened up the throttle and poured it on. It was a great crowd-pleaser, and of course it got them an encore — a piece that D’Angelo dedicated to the airline they’d flown and that opened with a roaring, screaming improvisation. Despite having four successful careers to juggle, Human Feel has now gotten together for two post-’90s albums — Galore, and the soon-to-be-released new album. I treated this show as my only chance to see the band, but now I’ve got my fingers crossed for the future. It was good to see Jim Ryan in high spirits for his 80th birthday concert last Sunday. The time slot competed with a few other good events, but the SIMM series at San Francisco’s Musicians Union Hall draws a good turnout. The room was nicely crowded and full of conversation between sets, fueled by cake and melting ice cream (the Union Hall’s performance space gets warm quickly). Ryan handed out glow bracelets and laser rings that everyone had to wear, and he put on a good show in two sets of flute, sax, and poetry. Beyond being a performer, Ryan has been an organizer and instigator on the scene. In the late ’90s and early ’00s, he ran a local zine, back when there were such things and most people didn’t have web sites. 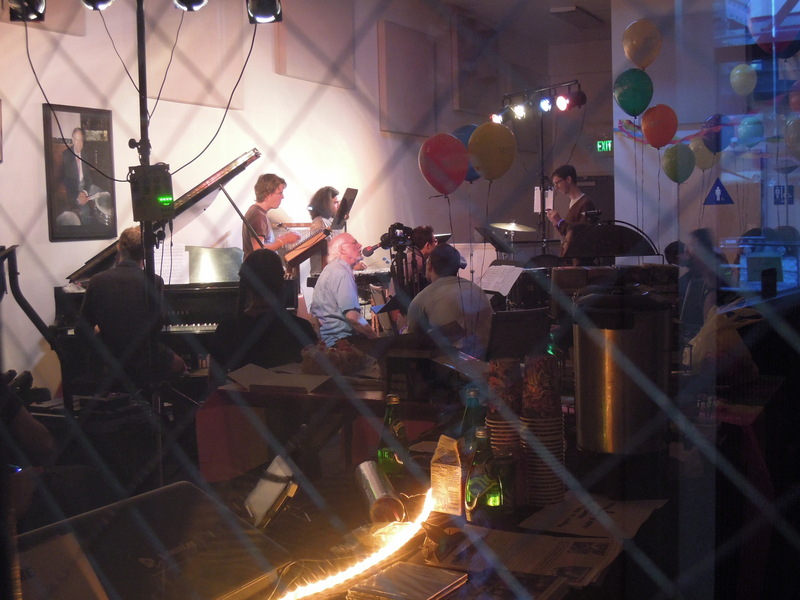 He also curated a few different weekly series, including one at the Starry Plough in Berkeley — a venue where the ownership and bookers are friendly to creative music, but the crowds sometimes aren’t. I remember one show there with a group called Mosthumbz — out-there, jazzy stuff with a heavy improv component. The bar was full of regulars that night for some reason, and they were grumbling about the music. But one of their compatriots — a guy with an Irish accent, even — stood up for the music. “This is what I love about the ‘Plough. You never know what you’re going to get,” he said, and he meant it. And he enthusiastically applauded every number. Organizing creative-music shows certainly has its frustrations. Hopefully, little moments like that enhance the rewards. Ryan’s birthday concert opened with Jordan Glenn’s Mindless Thing. 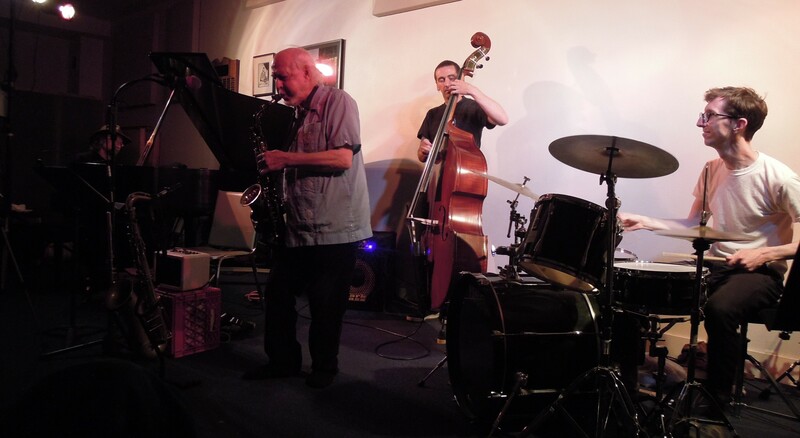 The band played drummer Glenn’s thoughtful, chamber-like compositions, which seemed to be built around Ryan’s poems, with music and words serving one another as accents and punctuation. Ryan’s poems were a gradual tumble of thoughts, introspective scenes cut with surreal changes of direction and a sense of humor. 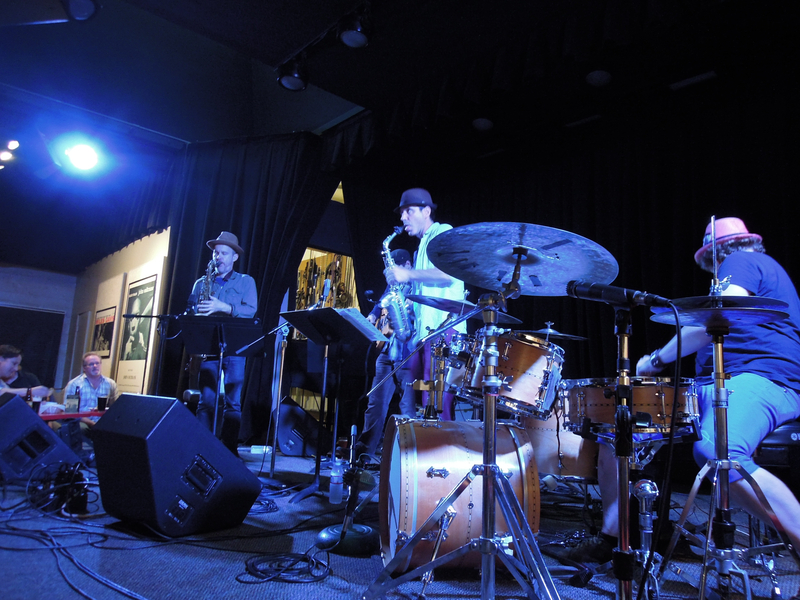 The band was heavy in tuned, percussive instruments — vibraphone (Rob Lopez), hammered dulcimer (Damon Waitkus), piano (Michael Coleman), and guitar (Karl Evangelista) for sounds that could be placid like deep water or rustling and restless like a mountain stream. Evangelista kept the guitar volume turned down, but still shredded madly in places, creating an oddly pleasant background fuzz — it was a nice effect. Their closing piece had everyone playing homemade can-and-string instruments, gently banging and plucking away. For the second set, Ryan led a quartet with Scott Looney (piano), Jason Hoopes (bass), and Jordan Glenn (drums) in a long, jazzy improvisation that kicked off as a fast and heavy post-bop bounce. They kept that jazz vibe going for a second piece featuring Rent Romus (sax) and C.J. 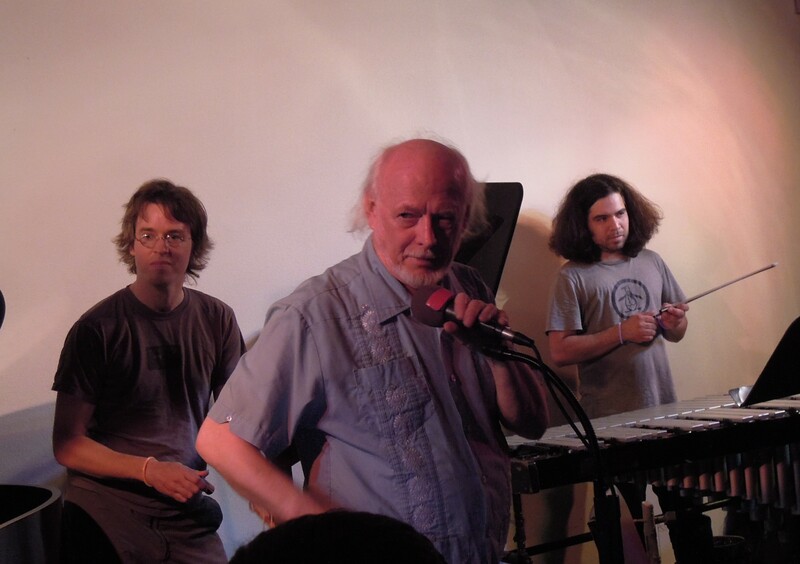 Borosque (trumpet), who along with Looney had been members of Forward Energy, a Ryan-led improv band. That piece took off like a screaming rocket and kept the energy going for the most part, a good upbeat way to close out the birthday celebration. Now in their third year of monthly song releases, the Rabbit Rabbit duo of Carla Kihlstedt and Matthias Bossi are building up quite a catalog. Their second album of songs, Swallow Me Whole, is due out on July 8, and they’ll be coming to the Bay Area with a show at the Freight & Salvage on Thursday, July 10, augmented by Myles Boisen on guitar and George Ban-Weiss on bass. 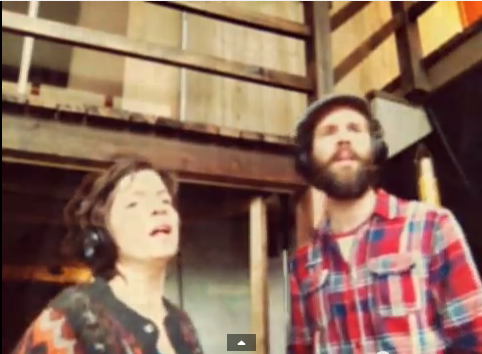 The songs on come from the Rabbit Rabbit Radio web site, a kind of online multimedia magazine that showcases a new song each month, with an accompanying video, photographs from the couple’s life adventures (including their ever-growing children), and some user-generated input. And the songs are something else, drawing from pop and Americana but also laced with the edgy experimentalism that’s defined much of Kihlstedt and Bossi’s careers. The styles range from delicate piano ballads to raw-nerve rock. They’ve been getting some deserved notice, too; “After the Storm,” from Year 1 of Rabbit Rabbit Radio, won in the “eclectic” category at this year’s Independent Music Awards. You can sample the Rabbit Rabbit catalogue on YouTube. 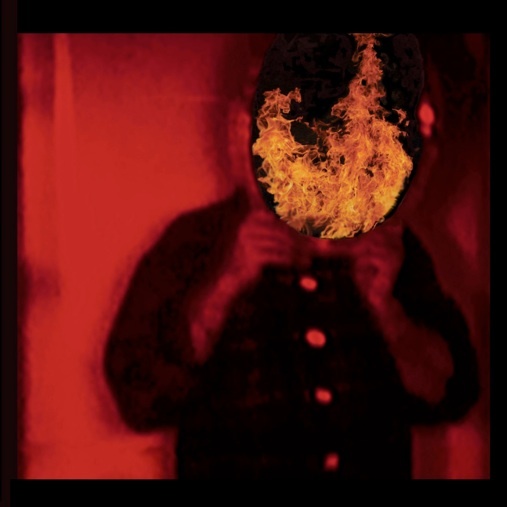 They haven’t yet posted this month’s knockout punch (“Nameless,” featuring Shahzad Izmaily on guitar) but here’s a video for “Falling Awake,” with guitarist Joel Hamilton, issued a few months ago. Rabbit Rabbit is trying out a couple of new ideas. For this year’s songs, they’ve been working with a guitarist each month, and Kihlstedt has set aside her trademark violin, which helped make her name in groups like Tin Hat and Sleepytime Gorilla Museum. Here’s something even more different: In lieu of being a CD, Rabbit Rabbit, Volume 2 — Swallow Me Whole is being sold as a limited-edition poster featuring all the lyrics and credits, and a download code for the songs themselves. It’s an interesting idea. I’ve been thinking that people buy CDs at shows more as souvenirs than anything else. Even in a digital age, it’s nice to walk away carrying something — so, why not a poster instead of a CD? Thur. July 31 — Union Hall, Brooklyn.